Janie Stapleton was inspired by how animals in the wild only sleep when they feel safe and comfortable. What Does the Fox Dream? 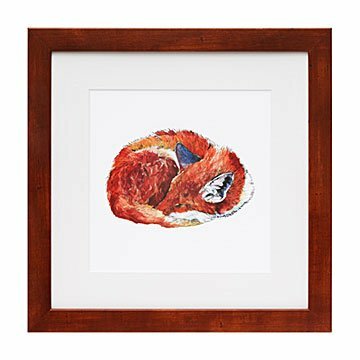 This sweet, sleepy fox makes a special bedtime companion for your own little wild thing. Artist Janie Stapleton was inspired by how animals in the wild only sleep when they feel safe and comfortable, and wanted to inspire those same cozy feelings in human children. Her brushstrokes catch the texture and rich coloring of the fox's fur, inviting even the wildest cubs to settle down for the night. Artwork made in Arizona. Printed, matted, and framed in Portland, Oregon. For every print purchased, we'll donate $5 to American Forests. Janie Stapleton is an illustrator from Northern California, and began painting at a young age with her mother and grandmother. Early on, Janie was fascinated and inspired by the natural world. After high school, instead of following a career path to art school, Janie chose instead to pursue an education in herbal medicine and primitive skills. Through that, she stayed close to her inspiration and continued to develop her art, eventually transitioning into a career as an illustrator. Now Janie lives and works in Arizona.